I need to preface this review by saying that I am not a fan of director Michael Haneke in any way, shape or form. I admire his composition, and I have always enjoyed the fact that as a director, he never feels the need to get "coverage" on a scene. In other words, he doesn't set up the standard shot-reverse shot conversations that we as an audience are accustomed to seeing. Apart from that I can't say anything else good about him. He is a provocateur, plain and simple, and he utilizes the cheapest of tricks to get a reaction out of an audience, such as lingering on static shots for an interminable amount of time and using sudden, shocking moments to relieve the ridiculous tension that he's built by simply not doing anything at all for extended periods of time (up to an hour in some cases). All that being said, I was strangely looking forward to seeing Amour since I had heard so many incredible things about it. I put aside the fact that I didn't like Cache, The White Ribbon, The Piano Teacher, Funny Games (either version) or The Seventh Continent, and decided to go into this with no biases. It didn't take long to get turned off almost entirely though, as he was clearly up to his old tricks within the first ten minutes of the film, holding on a static shot of an audience preparing to watch a piano concert, with our main characters framed just left of center, and the shot holds for several minutes for no discernible reason. If I'm missing something here, I'd certainly like for someone to tell me what it is and why I clearly don't get it. 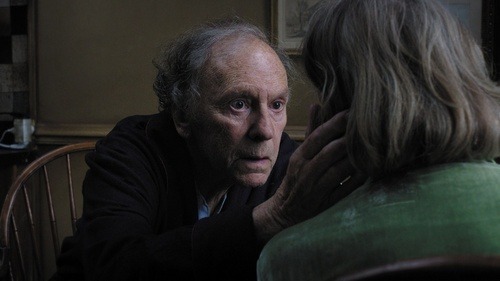 The film tells the story of two octogenarians Anne (Emmanuelle Riva) & Georges (Jean-Louis Trintignant) living in quiet isolation. One morning, Anne suddenly slips into a catatonic state & when she recovers several minutes later, she has no memory of the incident. Georges takes her to the hospital, only to discover that she's suffered a stroke which has left her paralyzed on her right side. Upon returning from the hospital, Anne makes Georges promise not to take her back to the hospital, no matter what happens to her. And thus the film is a long, slow march towards death for Anne, and Georges is left to take care of her by himself. 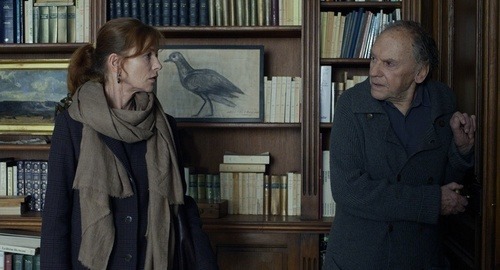 He refuses help from their daughter (Isabelle Huppert) & he fires a hospice nurse for being insensitive to his wife. And so the rest of the film plays out, sometimes in real time, as we watch this woman die, and this man attempt to care for her. It's a chore to get through. It's unsparing in its brutality and how unsentimental it is, and while it's likely the most realistic portrayal of the long process of dying, it's exhausting to watch when the audience has absolutely nothing to cling to in the way of relief. I understand that this is the point that Haneke is trying to make, I'm just trying to say that it makes the film almost unbearable to watch. I often feel like a philistine when I walk out of a film such as this and find myself completely and totally turned off by what the filmmaker was attempting to do. 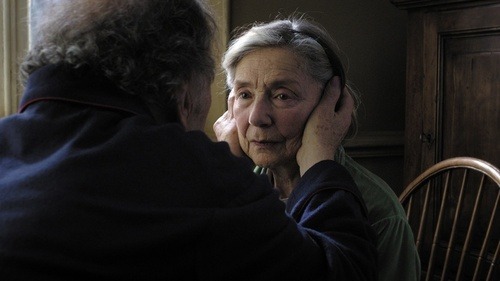 I consider myself to be a fairly enlightened film goer, I just can't handle a film as unrelentingly morose as Amour is. Much like Cache, the film relies on two big, startling moments to relieve the built-up tension, and just like in that film, they both feel cheap to me. They're designed solely to force the audience into reacting to something since the rest of the film has been dwindling in silence for so long. To my mind, it's no different than the cheap jump scares that come from any of the Paranormal Activity films, they're solely there to get a reaction from the audience. 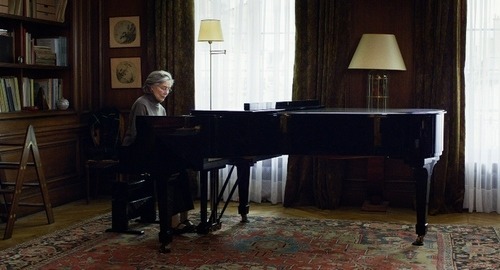 What makes them feel especially cheap to me in a film like this is the fact that Haneke is clearly not interested in goading the audience into feeling any sort of emotional attachment to his characters or situations prior to this. These two outbursts almost seem designed to jolt the audience awake after sitting in silence for so long. It's Machiavellian in a way, since it seems to come from a place of pure maliciousness on the filmmakers part. The two lead performances are both very good, and are likely the only reason I could even recommend watching this film. Riva is an actress that I've seen far too little of in the past, but she is in one of my absolute favorite films, Alain Resnais' Hiroshima, Mon Amour. Her performance here is spare, subtle & devastating. 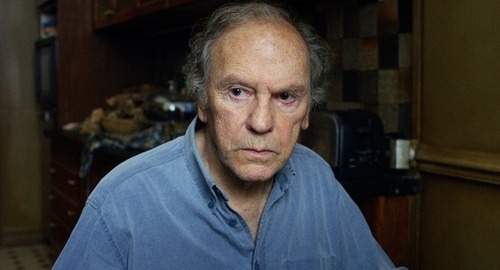 Trintignant is forced to do the heavy lifting and is quite good, in spite of the fact that his character is pretty curmudgeonly. If the two leads had not been as good as they are, this might have been one of the most irredeemable films ever made. I'd be willing to bet that your appreciation of Amour as a film will directly correlate to your appreciation of Michael Haneke as a filmmaker. He is undeniably skilled behind the camera, but his willingness to treat his audiences with contempt has all but turned me off to his films in general. Is there value in a film like this? Yes, but I think that there's value in other films that can illustrate similar points with more levity. Maybe I am a philistine after all, but I'd rather not be forced to live in a world where I'm forced to watch old women experience pain and yearning without the ability to gasp for some air.